I got my NANJG 106 (could be 105; it's hard to read) on Friday with my XM-L drop-in. I had been having trouble with my MC-E drop-in so I thought I would put it in there. I ran into a few problems getting it soldered correctly and then found a short in my LED + lead, but finally got the light working. I put in a little piece of wire from the 2nd star (clockwise) to the outer ground ring to get 3 modes instead of the default 5. It works, I got a draw of 2.2A on a battery at 4.1V, so I am charging it up to see if I can get more than that (got more like 2.5A on a 4.2V battery which may be about all my DMM will read or all the battery will supply). Anyway, Low and Medium on this one have absolutely the worst PWM I have ever seen. Hopefully I didn't mess up the LED, but it seems like it would either work fine or it wouldn't instead of somehow impacting the PWM rate. Also there doesn't seem to be any mode memory; at least on the 3 modes I have it set to now it always starts on Low, which is not how the SB version worked. Anyone else have any experience with this? If I can get my AVR equipment to work, this driver could be a good candidate for reprogramming. Here is the current one that Shiningbeam is selling, but it looks different from the one I bought, which looks just like the KD one. Maybe the KD model really is 105 and this one is the 106. Got it yesterday also, I pulled four 7135 and work perfectly , no pwm here, with the same bridge 1,4 A 420 mA 60 mA. One was for a AK-101 to fix the crappy modes of a P10 R5 received yesterday also hoping to reach 1,4 A 3 modes. Trying to measure with more resolution in the reading use an ampere meter with max scale 2A, big mistake, the max current was 1,1 A. At first I tought that the heat using to unsolder the chip kill it.The second was 'unsoldered' with a cutter ,did not work also , always 1,1 A.
I think you want to use the 10A setting because it has less resistance and will give you more accurate and consistent readings. "I think you want to use the 10A setting because it has less resistance and will give you more accurate and consistent readings." I know that just did not realize how sensible at resistance are those circuits, actually an ampere meter is a volt meter which test the drop voltage trough a shunt resistor , in 2A setting is five more resistance than in 10A. Also the regular test probes don't work, to a proper measure is need short tough wires. My mistake was due the fact that more digits mean more resolution, in a 10A setting 438 mA is show as .43 A.
I wonder why yours is working differently than mine? I do think at one point that I had a short between the + and - out, so maybe I damaged the MCU. Read about the new version here. Mine pulled 2.6A from 4.20V Black Trustfire, but my leads were too thin for such measurement. The real current may be even higher. Yes, but there is a fault in it. It has no purpose to cut star no.1 as it is only connected to ground (battery -). Leave it be. how are the modules pulled to achieve 1.4a? can you just take whatever ones off you want? or is there specific ones? i'm guess you just desolder them? also I have a copper slug I want to solder to the + battery connection..should I just put solder on the end of the copper then heat the other end? 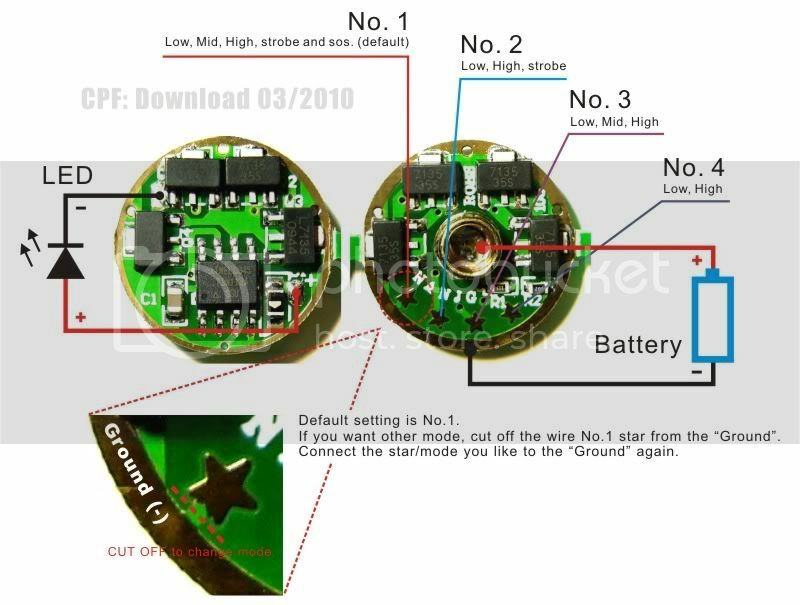 still waiting on this driver to come in so appreciate any help in the install process..soldering to the led is not an issue nor is the other driver to pill soldering..just wondering about the contact spring area.. I've been all the day trying to solder the black cable to the negative of the circuit.. any advice before I hammer it? hmm were very easy with my solering iron..it's a 25w fine tip pencil style..what are u using? use thin style flux core solder and pre-tin the wire you are soldering..that and holding the wire with a tweezer or needle tip pliers might give you better control..
Might help to put a little bend in the end of the wire. I can hardly even see what I'm doing because everything is so small. I just keep trying until it sticks. As long as there is enough solder on the pad, you don't hardly need any additional. Maybe just a tiny bit on the iron. I'm using a cheap 40W soldering iron. The problem was that I wasn't putting the tin on the circuit, but on the cable.. and it couldn't stick. I usually put some solder on the pad, some older on the wire, and just hold the wire to the already tinned pad and with a touch of iron it binds there. There is no way I could use solder, wire and iron at the same time, apart from through hole components and PCBs. Actually I'm a noob in electronics, and I'm discovering all this things now.. btw, what is exactly a pad? Oh, I'm talking about the point on the PCB you need to solder your wire to. The little spot on the circuit board where you solder.